I already adored Matteo’s cuisine, refined, surprising and involving flavors. Always, however, respectful of the proposed fish, whose flavor is skillfully enhanced by a delicate, soft, velvety cooking. A precious and accurate reinterpretation of the flavors of the sea and the lagoon. His eel left me breathless, never tasted anything similar before, even higher than the eel with the “amoi” or that of Comacchio with the cabbage! And what about the fillet of mullet, very soft and with that very light and intriguing scent that is not as correct as smoked or roasted. To these two dishes, a tribute to the lagoon and the sea, I dedicated a double page of my photographic book “Jesoul – the soul of Jesolo”, because up to a month ago the Locanda alle Porte 1632 was my favorite place, a historic building from the 1600s in a fluvial island between the river Sile and the Casson canal, in the territory of Jesolo. However when he introduced me to the new version of mullet fillet I could not believe my eyes. Matteo had managed to bring “the sea into the plate” !!! 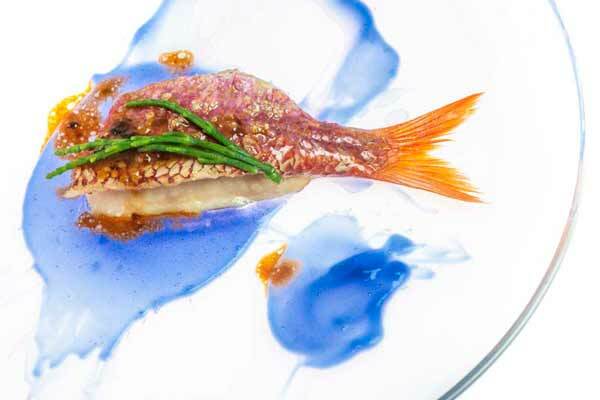 The red mullet seemed immersed in the blue of the sea, an incredible combination of complementary colors in which the orange-red of the fish contrasted with the blue of a transparent emulsion like water. On the palate then a scent of fennel was added to the “usual” refined flavors. A celestial food, made in the kitchen in an entirely natural way, is something that I like to define brilliant intuition and, as often happens in these cases, the result of an operation that is completely complex. Congratulations Matteo, from the heart! From the spring of this year, to look for its surprising flavors, I followed it to Lignano Riviera, in the “Ristorante alla Vecchia Finanza”, pleasant and quiet location near the mouth of the Tagliamento river a stone’s throw from the beach, with stunning view towards the sunset. A combination of sublime flavors, spectacular nature, discretion and human sensitivity … an unmissable experience !! !